On the 4th and 5th February 2013 (not far away now!) 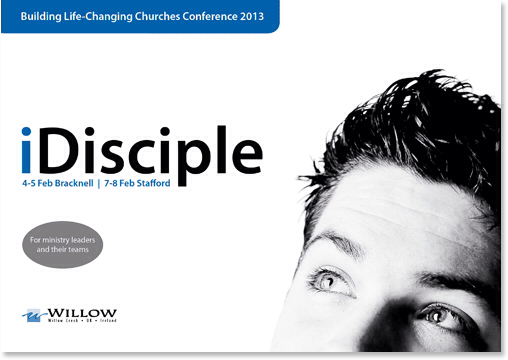 we're hosting a Willow Creek Conference called iDisciple, looking at how we can most effectively follow Jesus command to make disciples in our 21st Century culture. Two of the speakers, Gordon MacDonald and James Emery White, have been to Kerith before. Gordon, and his delightful wife Gail, have been over a couple of times, preaching on a Sunday, speaking at a men's day and running a marriage seminar for us. James came over in 2011 speaking at a two day conference with John Burke. They are both outstanding speakers with some unique insights on engaging people and culture. The other speaker, Mindy Caliguire, is part of Willow Creek Community Church, and speaks extensively on spiritual formation. Andy Jackson and Lee Layton-Matthews heard her speak at an event they were at recently and highly recommend what she brings. You can find a load more details on the conference here, as well as all the booking information. If you're part of Kerith then there is even a special rate for you! You can book in at the under 30's/full time student/OAP rate, which gets you in to one day for £30 or both days for £55. If you want to do this then you'll need our church login for the Willow site - email reception at info@kerith.co.uk if you don't know what it is.